What is it about gorgeous black horses that draw men in, set their imaginations on fire, and steal a bit of their hearts? As a child, I knew that horses were regal creatures. Because they are gorgeous, capable of intelligence, posses affection, and have a certain nobility, I was always smitten with horses. Nearly all horses have something to recommend them, even Seabiscuit with his knobby knees, too-big head, and short legs was a hero. 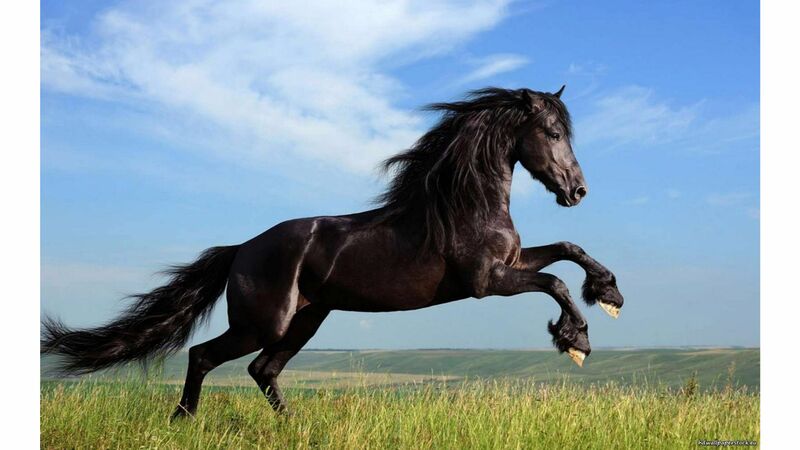 Black Arabians, however, are the stuff that dreams are made of. 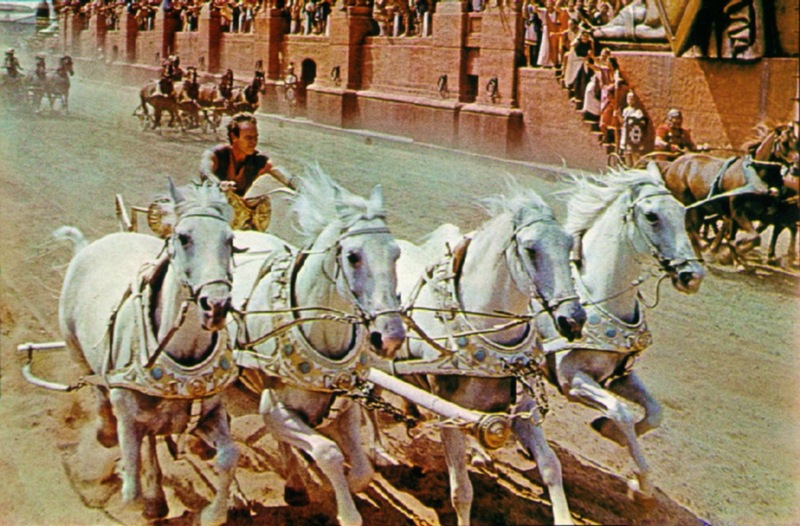 I grew up watching Ben-Hur and thinking that Judah’s white horses were a disappointment. In both the book and the movie, they are described as being near goddesses. And yet, their imperfectly white coats and grey-peach colored noses always seemed a bit unimpressive to me. Instead, I dreamed of gorgeous dark colored Arabians. Tall, strong, fast, and midnight-colored coats seemed, to me, to be God’s perfect expression of the horse. The standard by which all other horses would be judged. Strangely, my childhood was devoid of horse books. I knew that Black Beauty existed, but I never read it. I think that we had an abridged copy in my family library, but I didn’t know that authors could describe horses well enough to rival the beauty that movies could show. My love of horses came from movies, I think. T.V. series’ and movies like “Ivanhoe,” “How the West Was Won,” “The Irish R.M.,” and “Horse Masters” had me dreaming of falling in love with my own magnificent steed. 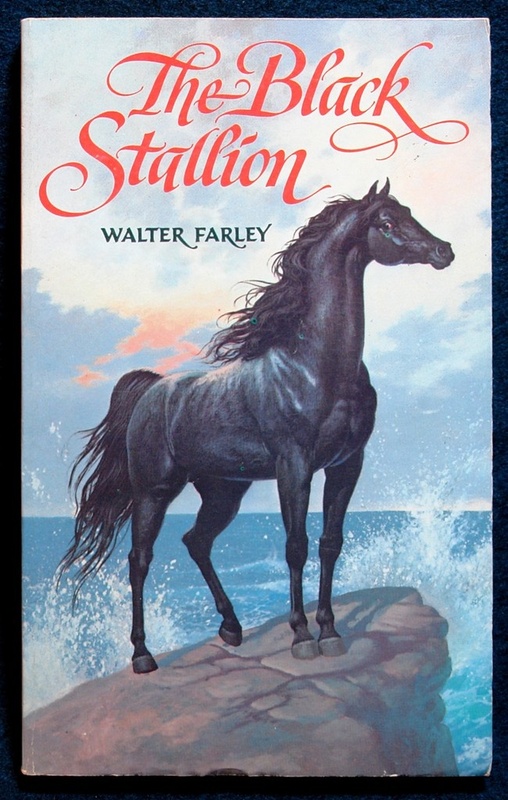 The Black Stallion by Walter Farley has to be one of the most famous horse books ever written. And yet, this bibliophile, had never read it until a month ago. I can say with all honesty, that I was missing out. I am sad that I did not have this beautiful book in my vernacular and imagination many, many years ago. Thanks to my book club, I am catching up on all of the worthy books I missed out on. We are chasing our own classics education, one book at a time. The Black Stallion is a triumphant and marvelous story. A young boy, Alec, is on a transatlantic steamer preparing for his return journey from visiting his uncle in India. His parents are waiting for him in New York and he is making this journey alone. As he contemplates the journey, he studies a beautiful pocket knife that his uncle gave to him before he left. Young readers, boys especially, will find it hard not to be intrigued immediately. Well-read readers will quickly guess that that pocket knife will not only prove to be essential but also representative of some central theme. 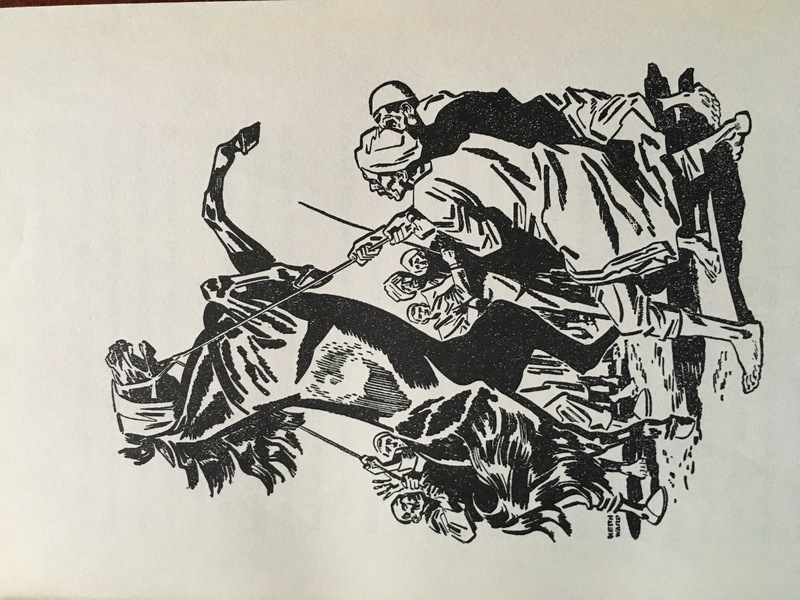 In case the prospect of following a boy through an independent sea voyage from exotic India isn’t enough to arrest the attention of the reader, Farley invades the scene with a tempestuous and exquisite black stallion who is being put aboard the boat. Fierce and powerful, this force of nature is not coming willingly. His mighty legs kick while his head thrashes and he destroys nearly everything in his path. Clearly this beast was captured from the wild and he has no intention of “settling into” captivity. All on board give the horse wide berth. All, that is, except Alec. Alec is enchanted by The Black. Without much than a hint of success, Alec tries to tempt The Black into friendship with sugar cubes. The horse is not friendly, but he is not too opposed to Alec’s presence near his stall. In the first chapter, we have a fairly perfect opening to what promises to become a story about a boy and his horse. All of that is put into question in chapter two, however, when a storm causes the ship to wreck. Lost at sea, Alec feels the whip of a rope and grabs hold of what is, in fact, part of the horse’s bridle. Together, the pair swim all night until the horse scents land and drags Alec onto the shore of a deserted island. Reminiscent of Kipling’s romantic and alluring style, Farley delights us with several chapters of survivalist and boy-tames-the-wild-beast narrative. The writing is poetic and musical. The details are fascinating and imaginative. A little bit Swiss Family Robinson and a little Ralph Moody, these chapters detail twenty days of creative survival. When Alec and The Black are rescued, they make the long sea voyage to New York via Rio de Janeiro. Along the way, we watch the friendship between Alec and this untamed wild horse grow. Despite their growing love for each other, The Black remains terrifyingly wild when interacting with anyone or anything else. 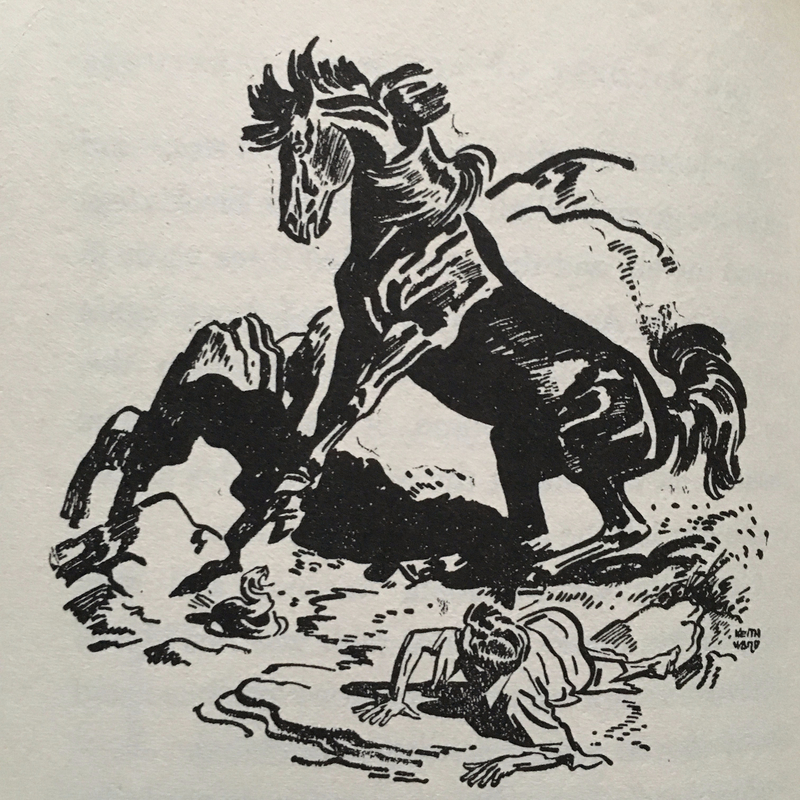 Alec must call on all of his own intelligence, courage, and patience to whittle away at The Black’s skittishness and break the horse’s wildness. When Alec and The Black disembark in New York, we meet Alec’s parents. Farley does a beautiful job sketching these characters. He does not give us much detail about them, but what he does draw feels quite authentic and renders them noble in their own way. They love this son whom they thought that they had lost. They want to support him. They are anxious about the wildness of The Black. They are deeply respectful of the experience their son has survived and they seek to honor his crisis-honed maturity. 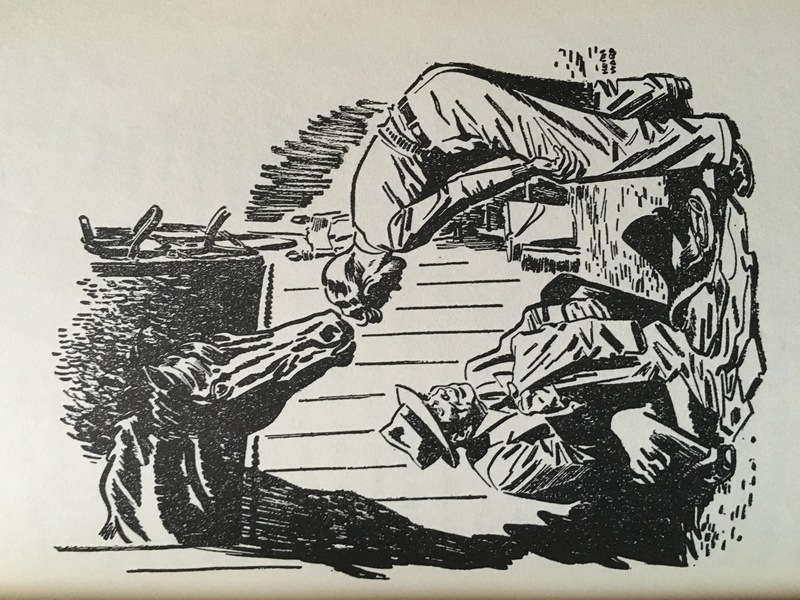 Once Alec is resettled into “normal” life and The Black has moved into the stables of a neighbor, the story shifts gears and becomes something akin to Come On, Seabiscuit. I won’t give any details but, suffice to say, Farley built The Black to be a great race horse. All of my children loved this book. My youngest (6) wants to be a cowboy when he grows up and he could not get enough of The Black. My middle child (7) loves good writing and enjoyed the adventure of it all. My oldest (9) is all boy and loved everything about Alec. As a parent, I loved that Alec is worth emulating. He loves and respects his parents. He is resourceful, courageous, and loyal. He is a willing student in the hands of an excellent old mentor. And, Alec is principled. The copy we have is illustrated by Keith Ward and it is magical. The audible narration is expertly done. The movie… well, let’s not talk about that disaster except to say that it is not The Black Stallion, it is something else with the same name and a few of the same characters. This is a book which more than delivers on its reputation. And, delightfully, this is the first book of a series! I haven’t read the others and suspect that they aren’t quite as good, but Farley has earned my respect and I think that any book he wrote probably has some merit.